UPDATE I: The Jefferson Parish Sheriff’s Office identified the victim Monday as 45 year old James Bennett, Jr. Rest in Peace. 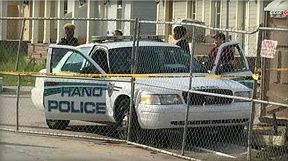 The shooting was reported at 7 a.m. Sunday, the New Orleans Police Department said in a news release. The victim’s car rolled forward and struck a curb after the shooting. Hmm, Romney visits Gulf Coast areas affected by Hurricane Isaac … where is Barack Obama? Mitt Romney, fresh off a successful Republican National Convention and officially receiving the GOP nomination for President, is off to New Orleans and Louisiana to tour areas affected by Hurricane Isaac. Romney will meet up with Governor Bobby Jindal, who did not attend the RNC convention so to take care of matters in Louisiana. Romney will be altering his campaign plans and not go to Virgina as previously planned following this mornings post-convention rally this morning in Lakeland, FL with his VP choice Paul Ryan. The GOP VP will go solo to Virginia later today. 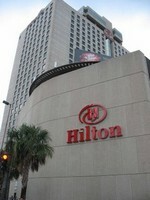 Mitt Romney will head to the New Orleans area today to tour areas affected by Hurricane Isaac. Romney and Louisiana Gov. Bobby Jindal will meet with first responders. Rather amazing that Romney finds the time to take away from his campaign to visit the areas affected by Hurricane Isaac. Isn’t this President Obama’s job? Then again, who is the candidate that actually acts and conducts them self is a Presidential manner? The entire New Orleans contingent that participated in the “Make the Travel Agents and people Aware” weekend need to be congratulated. 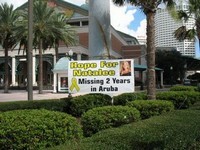 What a tremendous job they did in reminding people that Natalee Holloway is still missing and Aruba is still doing nothing over 2 years later. Aruba does nothing, but somehow they expect Americans to reward them by going there on vacation and spending their hard earned money. Thank you for the reports a long the way and the pictures. Scared Monkeys gives a big Hat Tip to those that came up with the idea of putting the “Where is Natalee” sign on the back of the horse drawn carriage (see picture below). BRILLIANT! The amount of eyes that saw that poster in the streets of New Orleans from an individual’s independent thought is simply fantastic. No ATA marketing campaign can compete with that type of grass roots ingenuity and perseverance. About 12:30 we moved our efforts to the French Quarter, where there were organized tours for the attendees. The Quarter also was crowded with tourists and locals, as is usual on the weekends. More reports in from those that went to the New Orleans Travel Show to remind those attending, Natalee Holloway has never been found in Aruba … neither has justice. 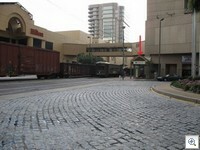 We have planned where we will put the banners tomorrow, and they still will be very visible. 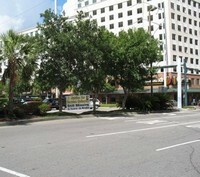 Tomorrow is the last day of this convention…and gatherings also will be held in and near Jackson Square, on the edge of the French Quarter, so we will try to put a banner on the car in a way that it still can be driven safely, then drive down the street which borders Jackson Square. In this next picture is a man from Haiti (right side- sitting on the while post) who showed much interest in Natalee’s being found and the family getting answers. He is holding a Natalee brochure. Behind him is the World Trade Center. Some of our signs also are visible. I am turning left again, toward Harrah’s, where you can see more signs…and some of downtown New Orleans in the background. 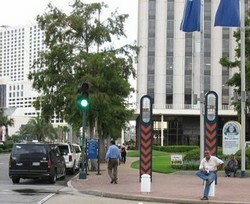 The Justice for Natalee Holloway faithful are back with more to report from New Orleans. Kudos to those who went in support of Natalee Holloway, her family and to remind others, don’t forget … do not ever forget. 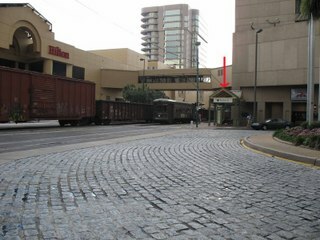 But we had a banner behind this white gate, which is the entrance to the River Walk Market Place, so that people crossing the tracks between 2 parts of the Hilton with rooms for guests, and people riding the Trolley could see it. The trolley in this picture is heading away—and just has passed the gate.